Commercial (or non-domestic) kitchen extract ductwork is sometimes referred to as ‘grease ducting’. It should be tested for Type A (fire outside) and Type B (fire inside). Both tests are required to prevent flammable grease from either catching fire when it passes through an adjacent area or, if the grease itself is already alight, causing a fire to start within the adjacent area by radiant heat. 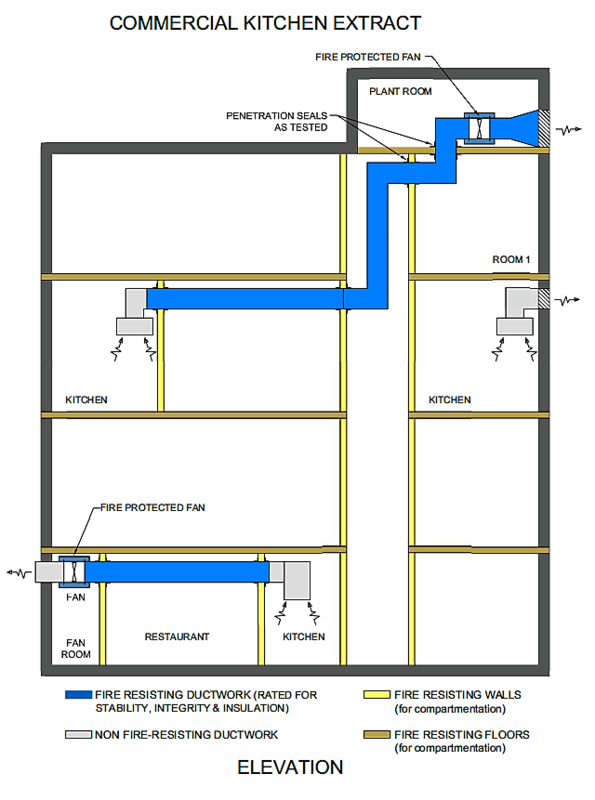 Where it is not possible to exhaust directly to atmosphere from the kitchen compartment, the ductwork should be made fire resisting from the point it leaves the compartment to the point of discharge / point it leaves the building envelope. The possibility of combustible materials building up on the inside of the duct is high and this along with the higher risk of ignition at the source – i.e. open flame cooking and fryers – means Kitchen Extract ductwork is particularly susceptible to the spontaneous outbreak of fire. These fires also burn with greater intensity than in general ventilation ductwork systems due to the presence of cooking fat and carbonized deposits which serve to fuel the fire. Although most Commercial Kitchen Extract ventilation systems would shut down in the event of a fire, they must retain their stability, integrity and insulation to prevent the fire spreading from one compartment to another. The potential for radiant heat igniting combustible materials outside the ductwork is another significant factor to consider. This is the key reason for specifying insulated fire resisting ductwork.